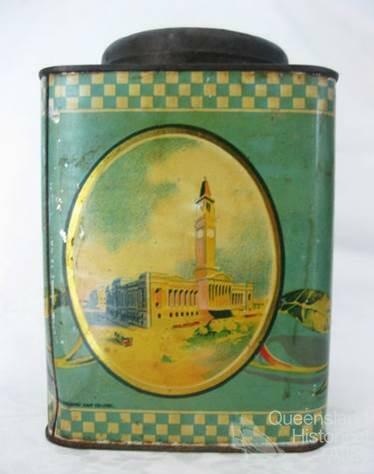 Souvenir wares can inform us about the social history of their times through the imagery with which people choose to represent themselves. 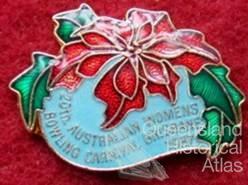 The poinsettia is the floral emblem of the city of Brisbane. 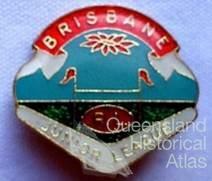 It was the first Australian capital city to adopt a floral emblem in 1930 and remains the only one so enflowered. Fast-growing, sparse-foliaged shrub with long canes bearing brilliant red flowers at their terminals. Flowers are actually bracts (highly-coloured leaves) clustered around the real flowers. According to the Royal Botanic Gardens at Kew, UK, the common English name ‘poinsettia’ was chosen by historian and gardener William H. Prescott in the mid-nineteenth century to honour Joel Roberts Poinsett, the first United States agent in South America, who introduced the species to the United States in 1828 where the foliage became popular in Christmas displays. It became the focus of a major industry based in California where the plants were grown in glass houses. Reducing the length of exposure to daylight in controlled environments brings the poinsettia to bloom for the Antipodean Christmas. 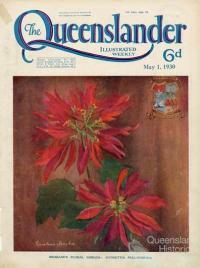 The poinsettia had a history in Queensland from at least the early 1860s when a report in the Queensland Times, 20 June 1862, of a governor’s ball hosted by Governor Bowen revealed that Walter Hill, the Director of the Botanical Gardens provided ‘the scarlet foliage of the poincettia (sic)’ that dominated the display of native epiphytes and palms in the covered courtyard. It should be easily propagated, and, therefore, cheap. It should lend itself to illustration and reproduction. 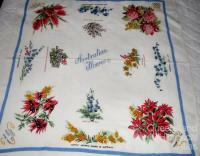 It should be small enough to be grown in a small allotment. It should be striking and arresting, showy. It should be hardy and be able to withstand the vagaries of the weather and climate. It would be of advantage if it was stock repellent. It would be an advantage to have a thornless plant. It is of much importance to select a plant that excels itself here. A plant that flowers during the tourist season might receive extra consideration. Exotics, that is plants other than are native to the soil, should not be debarred as horticulture, like music, literature, art, and science, is universal. Are we not exotics ourselves, and do we not consider ourselves a little better than the aborigines? This is a native of Mexico, first cultivated in 1854, botanically known as Euphorbia pulcherrima and Poinsettia pulcherrima. The chief beauty of the Poinsettia lies in the large vermillion bracta that surround the small, greenish-yellow flowers. The plant is easy of propagation, and thrives remarkably well about Brisbane; in fact world-wide travellers have declared that better poinsettias may be seen in Brisbane from June until August, than are grown in their native country. 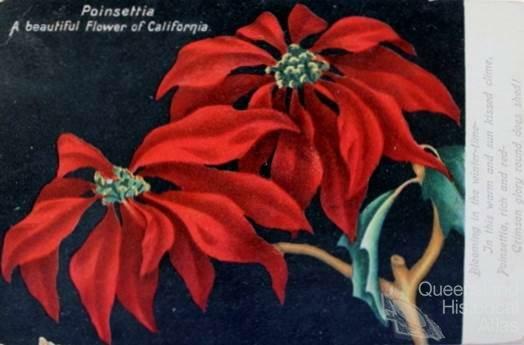 The ballot closed on 2 April 1930 and the results showed a narrow preference for the poinsettia (1294 votes) over the bougainvillea (1275). 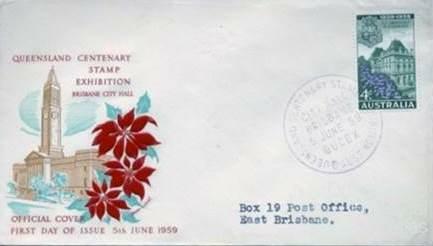 The poinsettia was formally adopted as the floral symbol of Brisbane at a ceremony at City Hall on 16 June 1930. 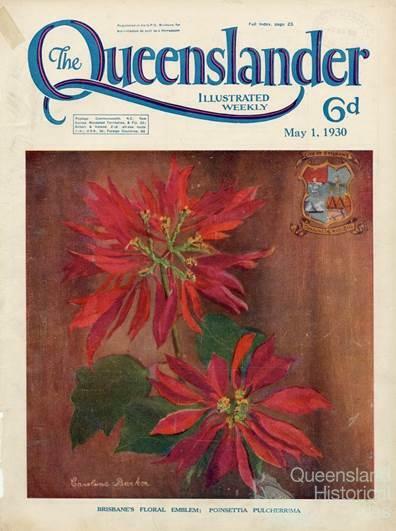 By then the weekly magazine ‘The Queenslander’ had already commissioned prominent Brisbane artist Caroline Barker to produce a painting of the poinsettia for its front cover on 1 May 1930. 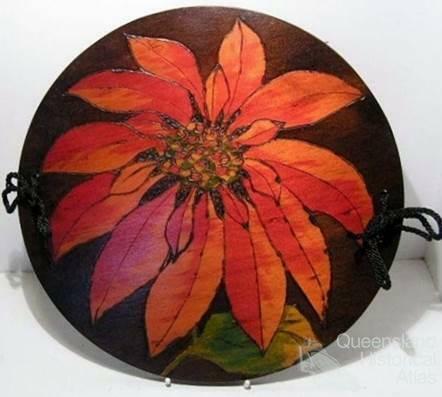 Curiously only three floral paintings identified as poinsettia were exhibited in the annual exhibitions of the Royal Queensland Art Society in the 1930s and Vida Lahey, Queensland’s most prominent floral painter, produced not a one. Breathing of spring and a world made new. Drowning life's grey in a sea of scarlet? And ever the conquering torrent grows. Wave your banners! Sing Hope's brave song! Till her fame goes forth―the wide earth through. The prominent stained glass artist William Bustard had also clearly made his decision as poinsettia was included in the stained glass panels over the side vestibules which were installed by the City Hall’s official opening. Poinsettias ‘branded’ the city. The Brisbane Courier 16 May 1930, reported that the Cosy Dell café promised a French-inspired poinsettia menu and the declaration of Poinsettia Day, and elsewhere poinsettia costumes featured in fancy-dress balls, Poinsettia Fairs were held by various church groups and the Poinsettia Social Club and Poinsettia Pastime Club were formed. Brisbane has taken kindly to its beautiful floral emblem, the poinsettia. On every hand the scarlet spray meets the eye – in souvenirs of the city, in paintings, and in needle and poker work. 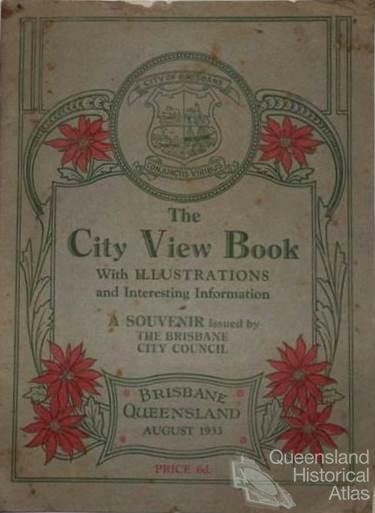 Some Brisbane organisations have expressed their civic pride by even having the poinsettia printed in colours on the outer covers of their annual reports. 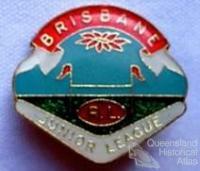 Its latest introduction is in the new jerseys of the Brisbane Rugby League team. 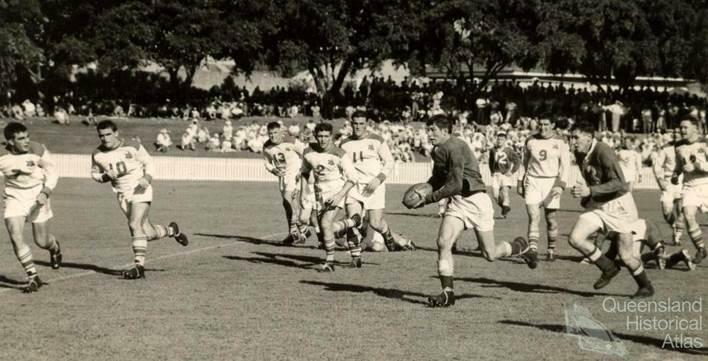 The team was applauded when, at the Woolloongabba Ground on Saturday, it took the field against Toowoomba wearing the recently-adopted colours- white, with scapular stripes of red, and a sprig of poinsettia on the left breast. 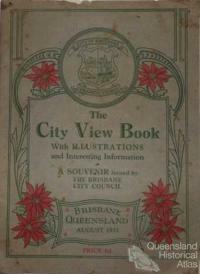 The Brisbane City Council followed suit by publishing ‘The City View Book’ of 1933 decorated with poinsettia flowers. 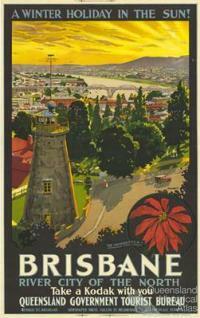 I am in complete agreement with Brisbane about the beauty of the poinsettia. It may be an immigrant, but it has made itself wonderfully at home. This is not surprising when it finds a soil rich enough to let anyone grow a banana-tree in his back garden: rich enough for arum lilies to be looked upon as weeds. The crotons and the jacaranda, the bougainvillia and the poinceana have all stolen their colours from tropical sunsets, but none has thieved so successfully as the poinsettia. Its flaming scarlet splendour makes England seem far away. 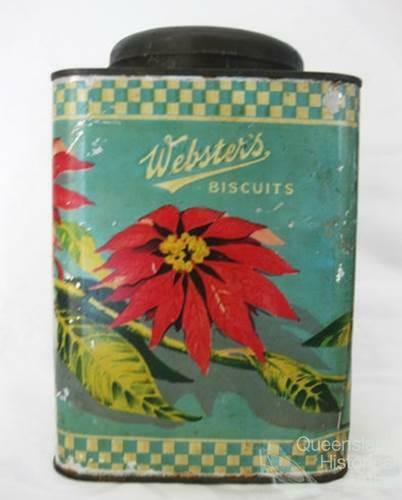 In the commercial field hand-decorated handbags were available while Brisbane soap manufacturers Campbells produced presentation boxes of poinsettia soap and cologne. The biscuit maker Webster’s celebrated the occasion by produced presentation tins depicting the newly built Brisbane City Hall on one side and the new city emblem on the other. After the second world war, the advent of cheap china from Japan flooded the commercial market with poinsettia decorated china, including ones depicting Story Bridge opened in 1940. 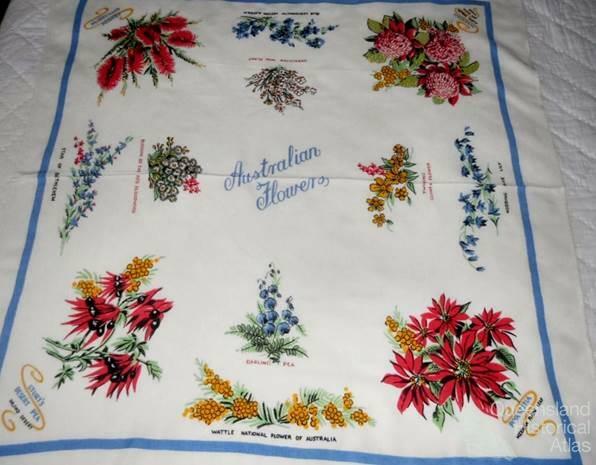 Souvenir wares linking the City Hall and the poinsettia were produced on tea towels, stickers, posters, postcards and other ephemera including an envelope commemorating Queensland’s sesqui-centenary in 1959. 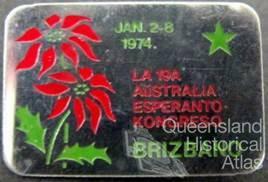 However, images of the poinsettia that became more broadly linked to the city of Brisbane itself continued to be produced in maps and postcards. 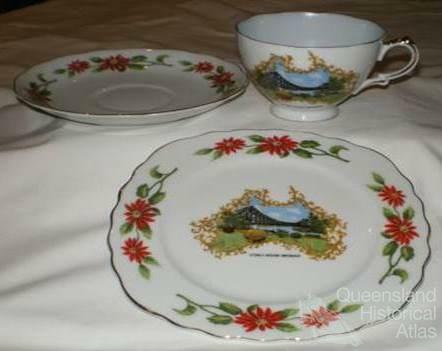 But the linking was becoming less specific until with the opening of the Queensland Art Gallery as the first stage of the Cultural Centre, Southbank in 1982, when the poinsettia had become one of the accepted icons of the city. On 5 April 2012 the highly regarded projection artist, Ian de Gruchy, was commissioned to create images Connecting Brisbane for the William Jolly Bridge Creative Lighting Project. The bridge itself was completed in 1932 and in the overlaying images of the poinsettia de Gruchy drew inspiration from the history of the bridge, the local area and Brisbane. 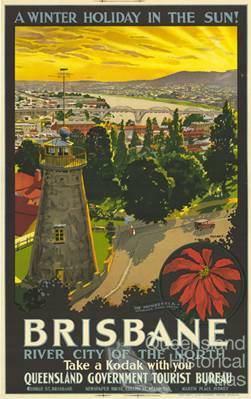 Although the poinsettia is an exotic plant to Queensland, its connection to Brisbane has extended over eighty years. Perhaps we should reassert its status and celebrate Brisbane’s winter sunshine by planting masses of the increasingly diverse and colourful poinsettia cultivars in public spaces so that Brisbane truly becomes ‘Poinsettia City’.